Now that the Congressional Budget Office (CBO) has released its score of the Senate’s Better Care Reconciliation Act (BCRA), it is clear why the Senate majority worked so hard to keep the text of the bill a secret. The truth is now out: an estimated 22 million people would lose coverage under the BCRA compared to the ACA. But the people who would lose coverage are not the only ones who would be worse off. Many Americans who kept their insurance would still face higher costs under the BCRA. For the average marketplace enrollee in 2026, the BCRA would raise their total costs, including net premiums plus cost-sharing, by $2,294. The effect would be particularly extreme for near-elderly and low-income enrollees. The average enrollee aged 60 to 64 would see a net premium increase of $326 and a total cost increase of $5,618. For older enrollees aged 60 to 64 with middle incomes at 375 percent of the federal poverty level, net premiums would increase by $10,253 and total costs would increase by $11,704. In this column, we present estimates of cost increases for enrollees in 2026, both nationally and for selected states. Starting in 2020, under the BCRA, the ACA’s financial assistance would be significantly downgraded. Although the structure of the replacement tax credit is based on the ACA’s, there are some substantive differences. First, BCRA’s tax credit is less generous. The ACA makes premium subsidies available for people with incomes up to four times the federal poverty level, but under the Senate bill, eligibility for tax credits ends at 350 percent of the federal poverty level. 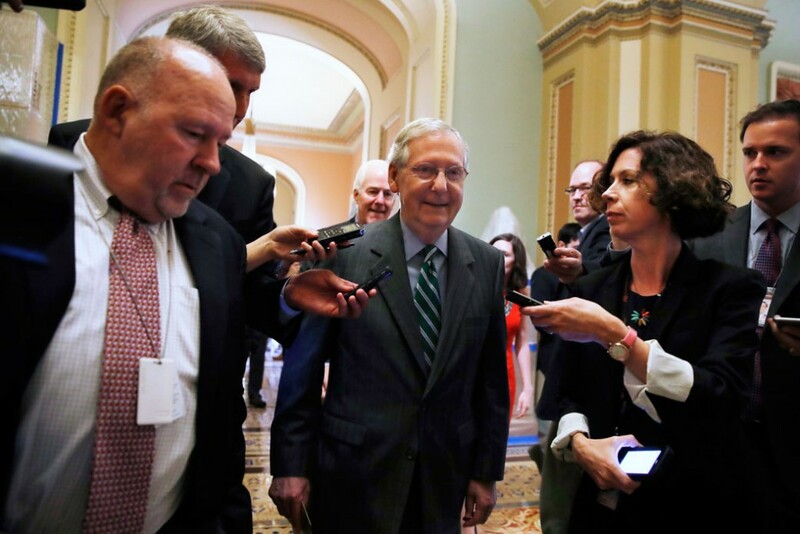 An individual earning $43,000 or a single mom with two kids making $57,000 would no longer receive financial assistance toward health insurance under the Senate bill. The subsidy amounts are also different from those in the ACA, most notably requiring Americans age 60 and above to pay up to 16 percent of their income toward insurance before subsidies kick in. Second, the bill does away with cost-sharing subsidies altogether in 2019. The ACA provides financial assistance to bring down deductibles, coinsurance, and copayments for low-income individuals and families. The median deductible among exchange enrollees is currently about $850. Under the Senate bill, benchmark plans would have deductibles around $6,300, meaning that coverage for most benefits would not begin until the enrollee had spent that much of their own money. For low-income enrollees, health insurance would thus cease to provide financial protection. Taking into account both the BCRA’s modification of premium subsidies and its repeal of all available cost-sharing assistance, we estimated annual net premium costs and out-of-pocket costs under the Senate bill. The sum of the two represents the total costs of health care. We then compared total costs under the bill to what they would be under the ACA in 2026, when the Senate plan would be fully implemented. We find that the average exchange enrollee would pay $2,294 more for health care in 2026 under the Senate bill. Enrollees under 250 percent of the federal poverty level, who would lose access to cost-sharing assistance, would see their costs rise $2,980 relative to under the ACA. Like the House bill, the Senate plan effectively imposes an age tax on older Americans by allowing issuers to charge them five times the premium of a younger person in addition to decreasing subsidies with age. Near-elderly individuals, or those ages 60 to 64, would pay $5,618 more for health care in 2026 relative to the ACA. The age tax means that states with older populations would have higher average increases in costs under the BCRA. We estimate that the average near-elderly Maine enrollee would pay $386 more in net premiums and $5,527 more in total costs in 2026. The average near-elderly Alaska enrollee would pay $1,970 more in net premiums and $5,700 more in total costs in 2026. The loss of tax credit eligibility for middle-class Americans with incomes in the range of 350 percent to 400 percent of the federal poverty level would be especially acute in regions of the country with high premiums. In Alaska, for example, an individual with an income at 375 percent of the federal poverty level would pay $21,436 more for health care under the BCRA. Combined, the effects of the age tax and the loss of eligibility for middle-class Americans would massively raise costs for near-elderly Americans in this income group. Nationally, the average enrollee aged 60 to 64 with an income of 375 percent of the federal poverty level would see their net premiums go up by $10,253 and their total costs go up by $11,704. In Maine, this population would see net premium increases of $11,127 and total cost increases of $12,112. In Alaska, it would see net premium increases of $47,834 (in this instance, there would be no difference in cost-sharing because the enrollee would hit their out of pocket maximum). Table 1 in the appendix displays the results of our analysis for selected states for 2026. These estimates only apply to states that do not pursue the ACA’s section 1332 waivers, which the BCRA would dramatically expand beyond their intended scope in order to allow states to waive some of the ACA’s consumer protections, including the essential health benefits standards. In waiver states, the actuarial value of plans and consumers’ total costs would depend on state regulations and individuals’ health needs. In its score of the BCRA, the CBO projected that half of the U.S. population would eventually live in states that made changes to essential health benefits standards using these waivers. As pre-ACA experience shows, when plans are not required to include essential benefits such as maternity care or treatment for mental health and substance abuse, some will choose not to cover them at all. The likely result would be a race to the bottom on benefits as insurers attempted to avoid the sick enrollees who would be attracted to plans with more comprehensive benefits. For people with expensive pre-existing conditions, waivers would mean increased difficulty in finding a plan that fit their needs as well as the likelihood of significant increases in health care costs—either out of pocket or through costly coverage riders. In other words, these waivers would critically weaken protections for people with pre-existing conditions. Many Americans would be hit with substantial net premium increases under the Senate repeal bill in 2026. But premiums alone cannot tell the full story of health care costs without including cost-sharing. When looking at total costs, the average enrollee across the country would see significant increases under the Senate repeal bill compared to under the ACA. These increases would be particularly severe for near-elderly and low-income enrollees. 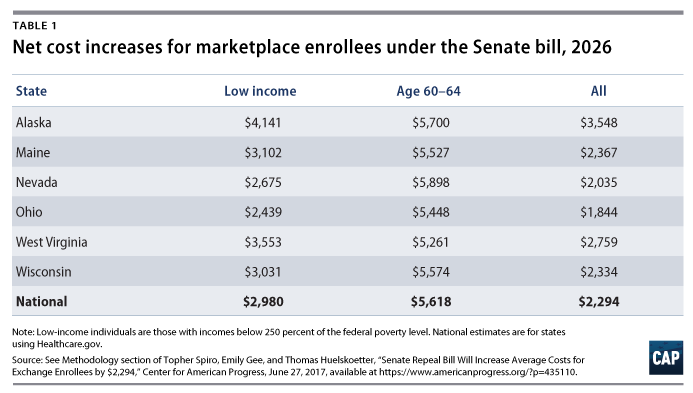 As this shows, the Senate bill would leave millions of Americans worse off, even among marketplace enrollees who would still be insured. Topher Spiro is the vice president for health policy and a senior fellow for economic policy at the Center for American Progress. Emily R. Gee is the health economist for the Health Policy team at the Center. Thomas Huelskoetter is the policy analyst for the Health Policy team at the Center. We use premium data from the U.S. Department of Health and Human Services (HHS) for silver-level plans—those that cover 70 percent of costs, on average. Then we applied the ACA’s tax credits to calculate enrollees’ premiums net of subsidy, using cross-tabulations from the 2015 National Health Interview Survey (NHIS) by age and income. We assumed that everyone in each income and age range had an income and age in the middle of that range. We estimated total costs and cost-sharing in several steps. First, we estimated what gross premiums would be without the ACA’s three-to-one age bands. It is necessary to calculate unrestricted premiums by age in order to calculate total costs and cost-sharing by age in the next step. Based on HHS guidance, this involves reducing premiums for young adults (age 18 to 25) by 25 percent on average and increasing premiums for the near elderly (age 55 to 64) by 25 percent on average, resulting in a five-to-one ratio between premiums for ages 64 and 21. Second, we used these premiums to estimate total payments to providers and out-of-pocket costs. Premiums represent the expected benefit costs that insurers will pay out plus an administrative load, which we assumed to be 20 percent. Insurer-paid benefit costs are therefore premiums less 20 percent. Because insurer-paid benefit costs represent 70 percent of total expenses, total expenses are equal to insurer-paid benefit costs divided by 0.70. Cost-sharing is then equal to total expenses minus insurer-paid benefit costs. Using the same NHIS data on enrollment by age and income, we adjusted cost-sharing to account for cost-sharing reductions provided by the ACA. To compare the effects of the two laws when the BCRA is fully implemented, we projected health coverage costs under the ACA forward to 2026. We inflated premiums using National Health Expenditure (NHE) projections, and we adjusted the subsidy amounts using CBO estimates and NHE projections. Our estimates of 2026 premium estimates under the ACA are very close to those in the CBO’s score. To estimate premiums and out-of-pocket costs under the Senate bill, we started with the premiums under the five-to-one age rating from Step 1 and adjusted the levels to match the bronze-level premiums in Table 5 of the CBO report. The Senate bill benchmarks financial assistance to plans with actuarial value of 58 percent, which also happens to be the lowest plan actuarial value insurance companies could offer in the absence of state waivers. Under the BCRA, therefore, 58 percent of total expenses would be paid by issuers for enrollees in coverage. We subtracted the 20 percent load from the premiums to find the implied total per enrollee expenses. In most cases, the remaining 42 percent of health expenditures would be paid by enrollees out of pocket. In cases where 58 percent actuarial value would cause estimated out-of-pocket costs to exceed the out-of-pocket maximum (MOOP), insurance companies would be required to fully pay for the benefits beyond MOOP. Our model adds any otherwise-out-of-pocket costs in excess of MOOP to the premium. Lastly, we determined the applicable tax credits for each age and income combination to obtain net premium estimates under the bill. We replicated the methodology that we used at the national level for selected states using data on 2017 premiums by state. State-level variation in premium costs results in substantial state-level variation in the difference in total costs under the ACA versus the BCRA. As a result, in states with higher costs of care, such as Alaska, the bill’s reduced premium subsidies and higher cost-sharing would result in a much bigger overall cost increase for enrollees.